JEFFERSON CITY, Mo. 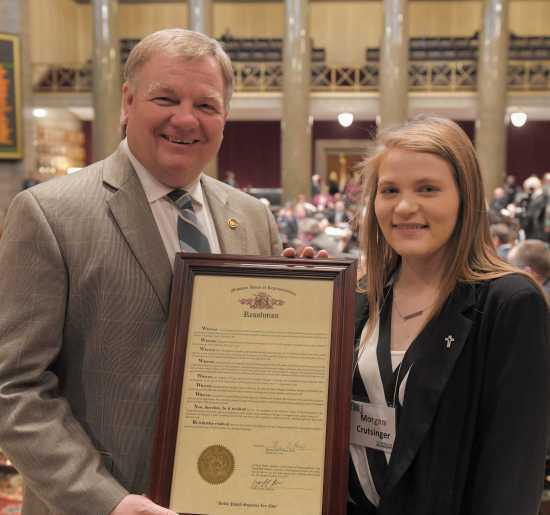 – Morgan Crutsinger, a member of the Delta 4-H Club in Cape Girardeau County, completed the University of Missouri Extension 4-H Legislative Academy, Feb 18-20. Morgan was one of fifteen 4-H members, ages 14-20, selected statewide to represent Missouri 4-H at the Academy in Jefferson City, MO. Senator Sandy Crawford (S-28) and Rep. Jeff Knight (H-129), legislative hosts of the 2019 Academy, introduced Academy youth on the floors of the Missouri Senate and House. 4-H delegates dined with legislators, agricultural leaders, and guests at the Jim Russell Foundation legislative banquet. Morgan and delegates learned about Missouri history through tours of the State Capitol, Governor’s Mansion, and Supreme Court. 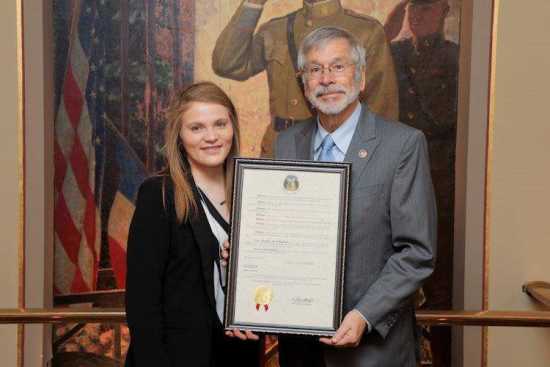 The Academy included opportunities for 4-H youth to meet with Governor Mike Parson, First Lady Teresa Parson, and Lieutenant Governor Mike Kehoe. Morgan and the group also visited the Missouri Department of Conservation’s Runge Nature Center and the Missouri Department of Agriculture headquarters, learning about 4-H’s partnerships with state agencies, as well as internships and scholarships available from Missouri’s agricultural commodity groups and Missouri Farm Bureau. 4-H Legislative Academy presenting sponsors included FCS Financial, First State Community Bank, and Missouri Pork Association. Delegate sponsors included Association of Missouri Electric Cooperatives, Axiom Strategies, Missouri Automobile Dealers, Missouri Cattleman’s Association, Missouri Corn Growers Association, Missouri Trucking Association, and Nelda Godfrey. Missouri 4-H is an active, dynamic organization of young people who are learning, growing and preparing to be the leaders of today and tomorrow – making a real difference in their community, country and world. 4-H is the youth development program of the University of Missouri and the nation’s Cooperative Extension System.